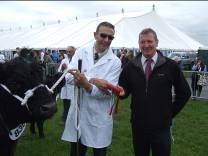 The rain stayed off for the judging at the Galloway Cattle Society’s National Show which this year, was held at the Westmorland County Show, Cumbria. 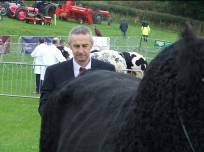 A quality show of Galloways awaited well known judge Mr Willie MacLean, Inverglen, Barcaldine, Argyll and the record breaking crowd which makes it one of largest one day shows in the UK. 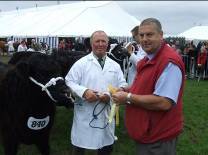 There was much celebration for the Ross Family, Romesbeoch, Shawhead, Dumfries as they took the overall champion, female, reserve junior and reserve male awards. Their overall and female champion was Moira 1003 of Romesbeoch. 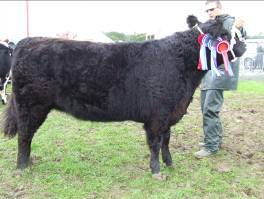 this 30 month old incalf heifer is by Kirkmabreck Nimrod, she was first prize at this year’s Royal Highland Show, breed champion and reserve interbreed champion at the Great Yorkshire Show Daisy 1177 of Romesbeoch secured the reserve junior award, this January 2011 born heifer is also by Kirkmabreck Nimrod. 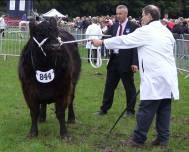 The reserve male was Murphy of Romesbeoch, this eight year old bull is by Lochdochart Gary and was reserve male champion at this year’s Royal Highland Show. 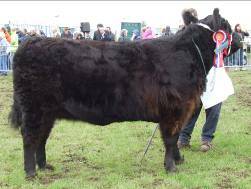 It was a tremendous day for the McMillan Family, Over Barskeoch, Dalry, showing under the name of Messrs Wallace, their two year old heifer Urica of Over Barskeoch secured the junior championship, reserve female and reserve overall awards. She is by a home bred sire, Greenloop Limited Edition and is the first heifer calf from Beatrice M of Over Barskeoch. 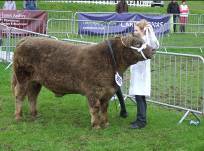 Urica is no stranger to the show ring as she was junior champion at the Great Yorkshire show, 1st at Stranraer and Dumfries, 1st and reserve champion at Wigtown and Glenkens shows. Male champion made the long journey from Devon, John and Sandra Heard, Hughslade, Okehampton, made the 700 mile round trip with Blackcraig Quartz. This Blackcraig Nimrod son was bred by John and Ann Finlay, Blackcraig, Corsock and sold at the Castle Douglas spring sale in 2010 for 5800gns. 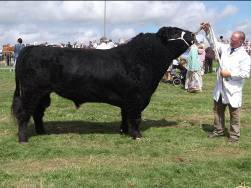 He was breed champion at this year’s Okehampton show. Pair of animals (led) – Perpetual trophy presented by Mr John McIlwraith, Canada. Championship Animal - Perpetual trophy kindly presented by the Family of the late Frank Hunter Blair. Most points in the Galloway Section, sponsored by MacMin per Mr Bill Brown, 32 Huntingdon Road, Dumfries. Natural Stockcare Ltd, per Mr Tom Stevenson, 56 Main Street, Braehead, Lanark, Lanarkshire. Dodds & Co, CA, 15 Rosehill, Montgomery Way, Rosehill Estate, Carlisle. Harrison & Hetherington, Borderway Mart, Rosehill, Carlisle. Cumberland and Dumfries Farmers Mart, Townfoot, Longtown, Carlisle.